This is a very beautiful book about a party being thrown in Pixie Hollow. No one seems to know who is throwing the party, though.The book opens with a little enveloped in the book with its own message in it. These are not drawings but actual items, which is kind of neat, in my opinion.The next two pages are about an invitation that Dulcie, the baking fairy, receives for the party. Included is one page with very beautiful artwork on it.The next two pages cover an invitation that Lily, a garden-talent fairy, receives, and this likewise includes a page with beautiful artwork on it. The next two pages show Fira getting an invitation and again some really good artwork.Finally, Rani and the water fairies get their own poetic message/invitation. The next two pages reveal who was the person who actually set up the idea for a party and why they did. The last two pages is a pop-up that finishes the story.A very cute book. 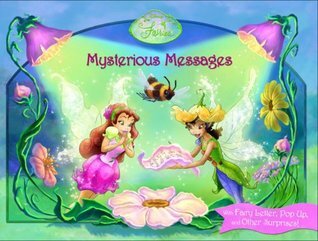 Mysterious Messages is the first Disney Fairies Popup book that I have seen. Although the book is only 11-pages long, it has a few neat things in it. The first is the mysterious message pinned to the Home Tree. It can come out of the envelope so a young reader can hold it in their hand and read it. There are some nice shiny items in some of the pictures and two popups. Of course, the Disney Storyboard Artist artwork is beautiful, like it normally is. The story is also a lot of fun because it shows many of the different types of fairies. Overall, I quite enjoyed this short, little, popup book and look forward to learning more about Disney Fairies and Sparrow Men in further stories.I rated this book a 9 out of 10.